About A & B Dock & Deck, Inc.
A & B Dock & Deck, Inc., established in 1995, operated business located in Jupiter, Florida, serving the needs of waterfront property owners for over 12 years. 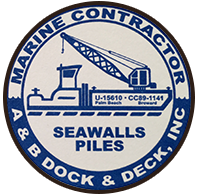 In addition to providing dredging and pile driving services, we have extensive experience in the design and construction of piers, bulkheads, boat ramps, and a variety of other marine structures. Marina construction is a company specialty. Our task is to provide our clients with excellent service, guaranteed quality work, and establish an ongoing business relationship.